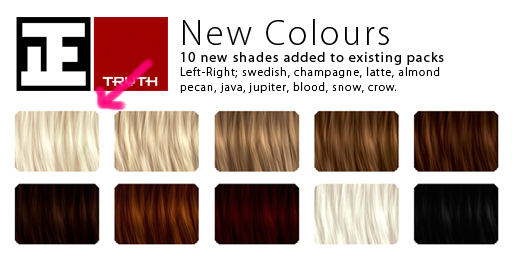 Truth has released four new hairstyles and 10 new shades of hair colors. I’m so happy about the Swedish blonde color!! Before this, I wore Mirage and Seaspray a lot, but Swedish is the perfect Platinum blonde shade. Visit TRUTH on the new Truth Hair sim, and check out the totally new build by the NotSoBAD people! *grumbles* Love several of the new shades but I really don’t want to have to rebuy all the hair I already have to get them. I agree Ayami.. He should do some sort of short term sale for the new shades.. why would we wanna buy the same full packs for one new shade?